Shirts With Random Triangles: LSU Recruiting: Tigers Add Three-Star QB Prospect Myles Brennan To Its 2017 Recruiting Class. LSU Recruiting: Tigers Add Three-Star QB Prospect Myles Brennan To Its 2017 Recruiting Class. Myles Brenan. Image via sun herald.com. LSU has added a sixth commitment to its 2017 recruiting class. Bay Saint Louis, Ms. high school junior quarterback Myles Brennan announced his commitment to the Tigers on Saturday. 247Sports grades Brennan as a composite three-star pro-style quarterback prospect. The website ranks Brennan at no. 28 among 2017 pro-style QB prospects, at no. 16 among 2017 prospects from the state of Mississippi, and at no. 676 among 2017 prospects nationally. 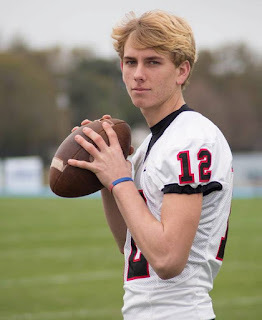 Brennan attends St. Stanislaus High School in Bay St. Louis, Ms. He stands 6'3, and weighs 180 lbs.